I’ll never forget my first holiday season working at TB&C when I was nineteen years old. Many people would come in to the store frantic and stressed out about all the people on their gift list, some they knew well while others were distant family they only saw once or twice a year. I grew to love guiding people in giving, slowing down and finding joy in the process as we navigated the store together. We could always find something for each person on the list even if was just a pair of wool socks. I always reminded customers that wool socks have the power to change someone’s life on a daily basis. Gift giving is an art form and an offering. It is an opportunity to connect and inspire. A simple gift has the potential to change someone’s life in big and small ways. I grew up in a family that valued adventure, the outdoors, and exploration. The gifts my parents gave my sister and I reflected these values, things like hiking boots, wool socks, a sleeping bag; items that got us excited about getting outside. I remember one year Santa brought a tent. Another year Santa left a sled on the roof! These gifts got us outside, setting up the tent in the yard, exploring sledding hills near our house. KEEP FEET TOASTY with Acorn. It’s the gifts that are connected to something greater that we remember. Some gifts even have the power to shape our lives by changing what we choose to do in our leisure time. It isn't the tent or the sled that changed my life, it's the adventures we took as a family. I can still remember nights under dark skies counting shooting stars, flying down the huge hill in front of our house when it snowed, our annual family camping trip at the Davidson River Campground in Pisgah. The outdoor oriented gifts I received sparked a passion for adventure that still guides my life today twenty-six years later. TRAVEL NECESSITIES - Great accessories for all the travelers in your life from Fjall Raven, Eagle Creek, Osprey, and Sea to Summit. As you make your gift list, instead of thinking about what things you want to give people, ask yourself what you want to inspire in your community? What adventures do you want to equip people for? What value do you want to share with people you love? 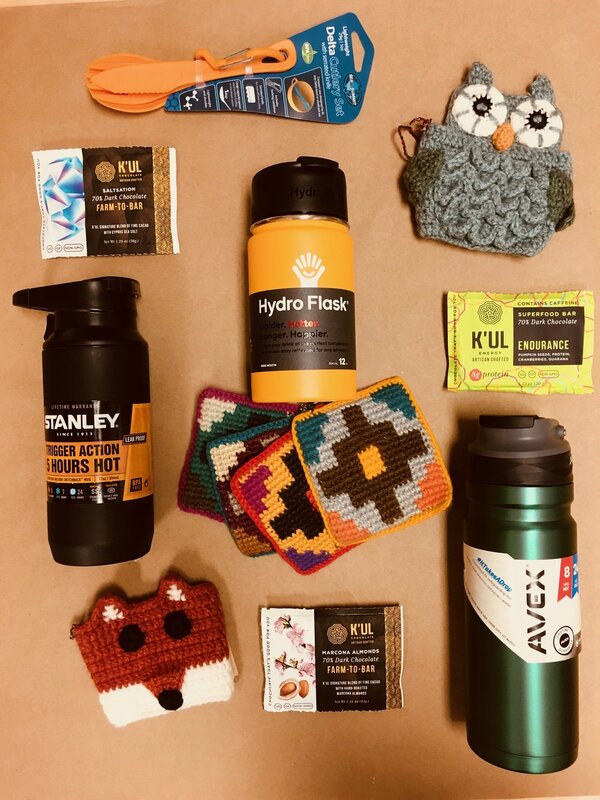 STOCK THE STOCKING - For the coffee and hot chocolate lovers in your life thermoses from Stanley, Avex, and Hydroflask make a great gift with some delicious dark chocolate from K'ul. 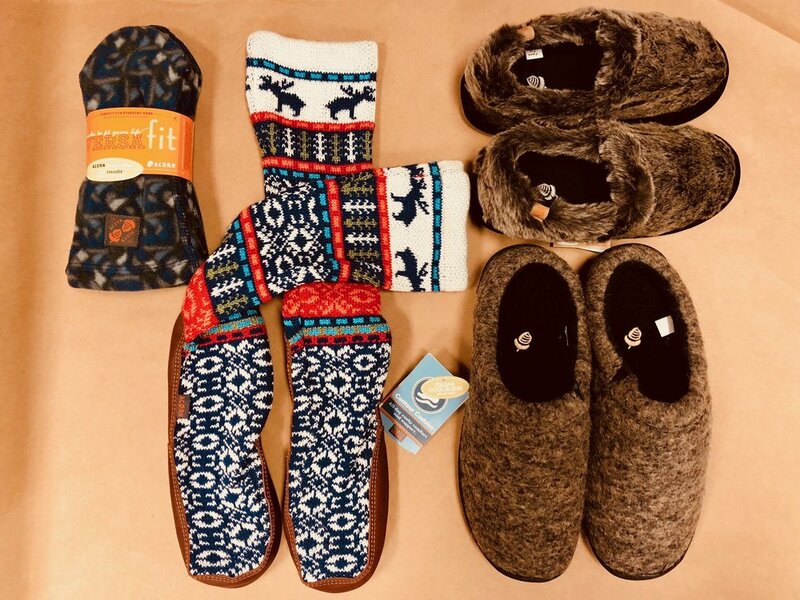 Top your gift off with Andes animal cozies! Instead of getting caught up in the anxiety of getting the right thing for everyone on your list, let yourself enjoy the opportunity to give something that reflects your values. Something as simple as a pair of wool socks can be the impetus for getting outdoors, for connecting to something greater. When we are truly comfortable outdoors, we can more fully experience the awe all around us in the natural world; the view from the top of Pilot mountain; the beauty of the Haw River rushing over rocks; ocean waves crashing on the wild beaches of North Carolina’s outer-banks. COZY WEEKEND - Kuhn Flight Jacket, Dish Jeans and a flannel from Dylan create a killer outfit that is comfortable and stylish. When you shop locally for your gifts, you give not just to those you love but to your community. And when you shop with TB&C, you support giving to organizations that keep the wild places wild. Make your gift giving a fun adventure instead of a stressful to-do. Shop local and know your gift is giving to so much more than one person. Remember that a gift can be an inspiration for how to live, a sharing of what you love with who you love; a chance to give what you value. 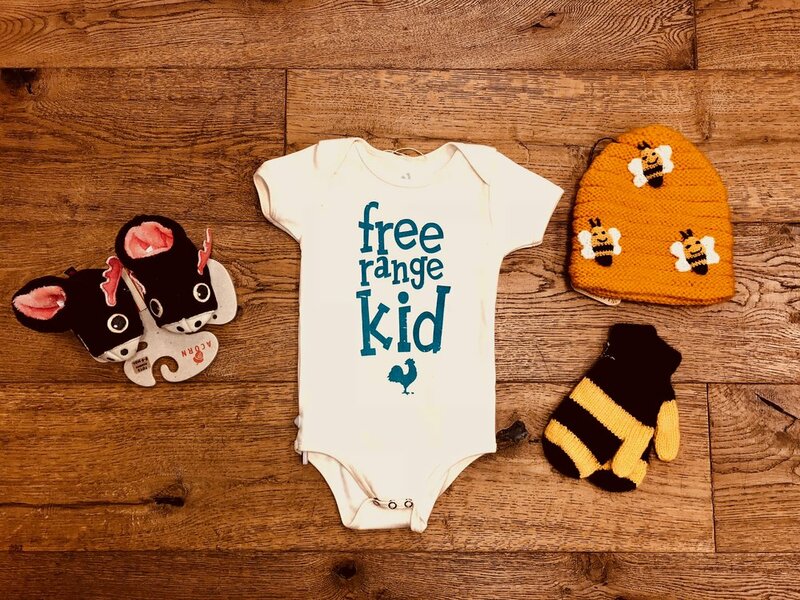 WONDER - For the cute babes in your life we have onesies from Locally Grown, animal slippers from Acorn and fun winter accessories from Andes Gifts. We love hearing from you! Comment with a story of a gift that inspired a positive change in your life. RE-TREAT - For the yogi in your life: a Manduka mat, towel and wash. Compliment the gear with a pair of Prana leggings and Icebreaker top great for layering over a yoga tank. 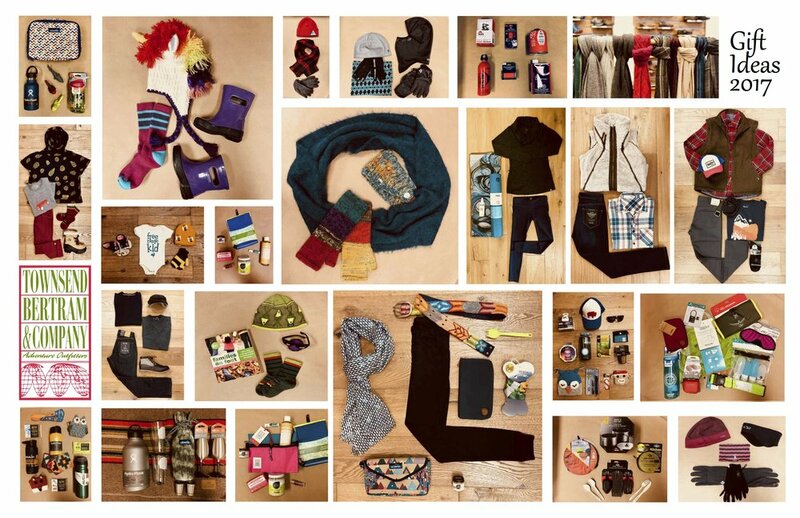 Stop by the store to check out TB&C's gift guide for great ideas for everyone on your list.